I used to find these responses annoying. But I’ve matured over the years and come to see them as amusing and even cute. I’ve also learned to smile graciously, knowing that 1. people mean well, and 2. it could have been worse. Having said that, though, I still haven’t gotten used to the first response. Does this happen to people from other countries as well? Japanese, do people say, “I love sushi!” to you the moment they find out where you’re from? Mexicans, do you get “I love tacos!” all the time? Filipinos, do people tell you they adore chicken adobo upon learning your country of origin? Swedes, when you introduce yourselves, do folks tell you they like your meatballs? You see, we all tend to judge things, whether or not we should, using what we would or wouldn’t do as the standard. Since I personally would not consider saying,”I love waffles!” to a Belgian whom I’ve just met, I find this whole blurting-out-a-dish thing a bit puzzling. The “I love Pad Thai” thing has happened to me so often I made t-shirts out of it. Anyway, how’s that for a completely unrelated intro to Tom Yam (ต้มยำ) – often transliterated Tom Yum)? Tom Yam came to mind because it represents another variation to response #1 above (it’s either Pad Thai or Tom Yam). And since I currently have no intention of blogging about Pad Thai, a dish that is virtually impossible to make excellently (unless you’re a fourth generation street food hawker in Thailand), I thought I would tackle this much less complicated dish. Tom Yam 101 Part One is on the old-fashioned method of making Tom Yam. It produces the kind of Tom Yam that you’re not likely to find in Thai restaurants due to its ugliness. I am of the opinion that most unbelievably good foods are often aesthetically-challenged. Old-fashioned Tom Yam definitely falls into that category. It’s delicious beyond description, but its appearance will make you gasp in horror and cover your children’s eyes. This is because it is made out of either bone-in or tough cuts of meat appropriate for simmered or braised dishes. Through this process, the sweetness of the broth is coaxed out of the bones and tendons and the meat becomes meltingly tender. It sounds good when you read the description, but if a simmered/braised dish like this entered a beauty pageant, it probably wouldn’t make it past the swimsuit round. Look at the picture at the top of the post — definitely not the kind of beauty queen Tom Yam you get at most restaurants wherein immaculately white chicken breast or adorable pink shrimp graces the bowl. But this is the kind of Tom Yam your grandmother makes. Rustic. Unpretentious. Old-fashioned. Rustic. Sacred — sort of. Meat: Use bone-in or tough cuts of meat in order to flavor the broth. Boneless or tender cuts do not have that power. Whole chicken, cut into chunks, works well. So do beef shank, pork hocks, beef shoulder, or even firm fresh-water fish cut crosswise into large bone-in steaks. For this batch, I used 2 lbs of cut up oxtail, because I adore it. The meat is so tough you need to simmer it for a long time to tenderize it. But oxtail gives back. Oh, it does. The effort and energy you put into the simmering is more than compensated for by the sweet broth it produces. (Oxtail Tom Yam is not a first date dish, though. I have to warn you about that. Have you eaten a piece of oxtail? You can’t eat it with a fork and a knife, you know? Water: It doesn’t matter how big a batch you’re making or how much meat you use. Just put the meat in a pot big enough to hold it and enough water to cover about 2-3 inches above the meat. You don’t need to use broth; the meat and the bones will turn water into broth in the process. Aromatics: You need the indispensable trio of Tom Yam aromatics – thin slices of fresh galangal (no galangal powder! ), fresh or frozen kaffir limes leaves (bruised), and fresh (no dried or powder) lemongrass (cut up and lightly bruised). As a rule of thumb, I think a combination of one kaffir lime leaf, 2-3 slices of fresh galangal, and one 1-inch piece of lemongrass is enough to flavor every two cups of water you use. So regardless of how big or small your Tom Yam batch is, as long as you stick with this water/aromatics ratio, you should be fine. Add the aromatics to the pot after the oxtails have already become tender and leave them in there to infuse the broth for no longer than 10 minutes before taking the pot off the heat. Seasonings: Lime juice (no vinegar or lemon juice), fish sauce, and either fresh or dried Thai bird’s eye chillies (crushed or pounded) make for proper Tom Yam seasonings. When it comes to old-fashioned Tom Yam, I usually add one tablespoon of fish sauce per one cup of water at the very beginning of the simmering, so that the fish sauce will flavor the meat as it cooks. The other seasonings are added along with the herbs after the pot has been taken off the heat. That way, the lime juice taste remains fresh and vibrant and the fresh chillies remain aromatic. The amounts of these seasonings are according to your individual taste. One thing I don’t add to Tom Yam is sugar. The broth packs enough natural sweetness that I don’t think it needs any added sweetener. But some people do like it.The use of Thai sweet chilli paste, Nam Prik Pao (น้ำพริกเผา), is optional. Even though I use it here (thinking the bright orange color from the toasted chilli will camouflage the ugliness of the oxtail), I don’t always use it. This is especially true when I make Fish Tom Yam when I think the toasty flavor or Nam Prik Pao kind of takes away from the fresh and delicate flavor of the fish. But this is all up to each individual. Nam Prik Pao has sugar added, so if you choose to use it, you may want to omit sugar. Vegetables: Mushroom is probably the most common. Some people add fresh tomatoes. I’m a minimalist; I usually add none. If you choose to add mushroom or tomatoes to your old-fashioned Tom Yam, add them about one minute before you take the pot off the heat. They don’t need to be simmered as long as the meat. Herbs: I only use fresh cilantro. To me, Tom Yam is not Tom Yam without it. I can do without green onions or fresh mint leaves which some people add. Whatever you choose to add, add them at the very end. I usually take the pot off the heat and let it all cool down a little before adding the fresh herbs. That way more of the color and the fresh taste and aroma of the herbs will be retained. But I think I’ve mastered Pad Thai:). the Korean American Kimchee lover! Hahaha! I love the way you write! It was hilarious. I’m Korean, and I definitely get my share of “I love kimchi!” And most of the time people just assume I’m chinese because I’m Asian. And also, when I mention I grew up in Singapore, they wonder how I learned to speak English when English is the national language of Singapore! Thank you for the wonderful recipes and good laughs, now, may I have a wish? Thong Yip, please please. Tom Yam…Ox Tail… Ox tail is the way to go, thanks Leela. Being Canadian, I have been asked about igloos and the likes. Many are disappointed when I point out many of the states actuaully lie north of my home Toronto, and we live in houses made of all things brick and not snow blocks…but I am always on the look out for a polar bear running wild in the neighborhood, as they may attack my pet seal! OMG. This post was just too funny. We have heard the silly things that come out of people’s mouths, and it can be rather ridiculous. Stewed oxtails are the only way we’ve ever had them, so this is an interesting recipe to read up on today. Thanks for sharing it. Yes, as far as I know there is bacon and Peameal bacon…I am partial to ‘Bacon’…does that make me Un-Canadian,I don’t know, I’ll have to check my passport. I do not find anything about that dish ugly. It is all beauty, all wonderful! Just reading the ingredients has me craving a taste! I’ll have to go to the Asian market this week and make some for after my wisdom teeth come out. I suspect it will greatly aid my recovery! Oh, and being from Texas I get a lot of hokey cowboy questions, and when I was in England I got asked about BBQ non-stop! Too funny. Sorry you have to smile and suffer through that! Your broth looks amazing. I love the colors. Hahaha,I’ve gotten the adobo line many times. Lately, it’s been more of the “Ooo…I love those skinny eggrolls.” LOL. 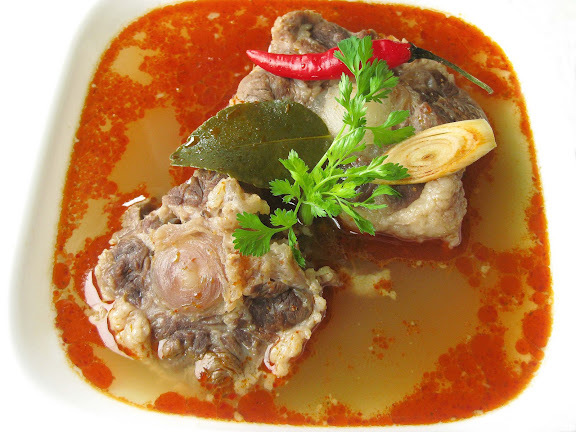 I’ve heard of Tom Yam, but have never tried it and Ox tail in general. I feel like I’m missing out. That’s true, Adrienne. Now that I think about it, a friend from Vermont once said people often told him they loved maple syrup. Thanks for sharing this wonderful recipe for Tom Yam. I would love to make it sometime soon! I know what you mean-I’ve heard a lot of “we love tandoori chicken and curry”!! I may at one point or other said some of those cringe worthy bits, god I hope not, but I have certainly heard others. I remember being in a bar with some Swedish friends, and a guy comes up and says he know Sven from Norway, and you can guess how that goes. Tom Yam sounds just incredible, and I look forward to trying it. This dish looks like such a lovely belly warming meal, that I cannot wait to try it, perfect for a cloudy damp SF evening. Is the process the same as with shrimp? (In general I prefer it to meat.) Can’t wait for the next part! But you’re right to take it easy! And how do I make Tom stop yamming? I love your humour! There are many food blogs out there, with great pictures and some with wordy narrations, but yours has all the right ingredients to make it a truly superb one – humour, wit, straightforward writing, glorious pictures, wonderful and original recipes and the best bit is – your blog teaches too. I keep coming back to your blog. Thanks! I’ve never had oxtail in tom yum! Looks and sounds gorgeous! I hate the do you know who and who question, I just give them weird looks. You’re right, I’ve never seen this style of tom yam available in any Thai restaurant I’ve visited. How come people always save the good stuff for home? 🙂 Thanks for posting this. Definitely plan on trying it sometime soon! Will have to try. After trying to find the elusive great bowl of Tom yam outside Thailans and even in Thailand I’ve given up even trying. Your recipe could be the solution. Thank you! I am also looking for the recipe for I think Kuey teow hang which I had at Pi’s Thai Cuisine 14 years ago which was one of the best Thai dishes I’ve ever had. But can’t seem to find this dish as I had it. My memory is that there was about 3/4 inch of liquid at bottom. Any idea?? Anon – People have different ideas of what a great bowl of Tom Yam is like. This recipe represents what I grew up eating outside the home. The version I always had at home didn’t even have Nam Prik Pao in it. And these days, more than 50% (based solely on my observation) of Tom Yam served around the country (of Thailand), has evaporated milk in it to make the broth thick and creamy. What I’m saying is, the best way to tackle this is not to look for the Holy Grail of a recipe for that may not exist. I’d recall the characteristics of the type of Tom Yam I like and use all the recipes out there as a guide to achieve those characteristics. After all, there’s not much to Tom Yam. It’s just an infused soup. I recently had a conversation with someone who said to me that he hadn’t found a perfect recipe for Tom Yam, and this one didn’t meet his expectations either. After having listened to him explain in detail the characteristics of the Tom Yam he liked, I told him to get a jar of commercial Tom Yam paste and follow the instructions on the label. Turned out, that was exactly what he was looking for. He fell in love with this kind of Tom Yam served at his local Thai restaurant in Ohio and couldn’t, up to that point, figure out how to replicate that flavor. All the recipes he’d tried had failed him. There’s nothing wrong with liking TY made from commercial Tom Yam paste; one just needs to recognize that perhaps that’s what it takes to get what one wants. This may or may not apply to you. As for Kuay Tiao Hang, it’s not a dish; it’s a class of dishes. There’s a way to make these dishes, and I hope to post it here soon. question: there’s a huge debate over whether to put the fish sauce at the end of the cooking or anytime throughout. some people swear that boiling it in the soup results in a fishy taste, hence the need to add it just before serving.. i wonder if this is more unnoticeable in this recipe because the ox tail imparts a strong beefy taste that masks that? uh oh – For a slow-cooked dish like this, I would personally want to season the liquid I cook the meat in so at the end of the cooking time it will have taken on some flavor. If you add the fish sauce towards the end, the broth will be seasoned but the oxtails kind of bland. For a quick Tom Yam (like shrimp tom yam) which does not involve long, slow stewing of the meat, the fish sauce can be added towards the end — even off the heat. I get the opposite – I’m from the UK and when I travel people tell me how much they DON’T like British food! With the oxtail version, should the water be at a “gentle” boil as with the other tom yam recipe? Or a steadier boil? I’ve never cooked oxtail — that that water temperature, how long should I expect before it gets tender? Eric – Welcome to the Nam-Pla Prik club. Glad you joined us. Thanks for the massaman report. For the oxtails, you can use higher heat, because it’s a much tougher protein and requires long, slow cooking in the same manner as pot roast or beef stew (which you can’t do when dealing with shrimp or chicken breast). You don’t want the water to boil furiously, but kept a gentle simmer the whole time. It will take you a long time, so be prepared. If you want this for dinner at, say, 7:00, start the process around 2:00-3:00. Exact time varies. Smile Leela, It could be worse! All this to say that I’m really glad I stumbled onto your site today. I think it is creative and witty, and all the recipes seem delicious! congratulations on all your awards- they seem well deserved! I love your site. I lived in Chiang Mai for seven years and miss the food so much. I’m British and funnily enough, no-one ever comments on our cuisine wherever I go! When I told Thai people where I’m from it was usually “I like Manchester United” or “Mr Bean”. I was often asked if i knew the british friend too – sometimes accompanied by a photo. Occasionally I’d also have to pose for a picture so no doubt somewhere someone is being asked if they know me. My friend used to make a Tom yam with a deep fried freshwater fish slapped on top at the last minute. It was awesome and I’ve never managed anything close. Will definitely give your oxtail version a shot. Hi Leela, all your posts are great, I’m a big fan of Thai food but it’s hard to find Thai restaurant here so I’ve to make do. I stumbled upon your How to grow coriander for Thai cooking, and am actually growing some in a pot now to save the roots for winter. 🙂 And i noticed that in your Tom Yam recipe, coriander roots is not used, is it because you didn’t have them handy when you write this post? I am familiar with Tom Yam that use coriander roots. I’m quite puzzled actually wether it’s ‘authentic’ to use the roots. If so, when should we throw the roots into the pot? Wish you could help me out. Thanks. zs – Cilantro roots aren’t usually used in Tom Yam, though I’m sure adding them won’t hurt (doubt you can taste or smell them, however, with all the strong flavor and herbal scents going on). They’re sometimes added to some regional soups that are similar to Tom Yam, e.g. Tom Saep. I just finished cooking and eating this dish, with oxtail, and it is so good! Totally delicious! What a great story, idea, and recipe. Thanks! What fish do you use in Tom Yam, Leela? What works? This soup is so addictive! The flavors are irresistible. Among my favorites are catfish, mahi mahi, halibut, trout, and swai. For fish tom yam, I don’t use nam prik pao and I add mint leaves to it at the end. That’s how my family made it when I was growing up. I’ve been looking for a good Tom Yam reciepe for a long time. I love this soup so much and I’ve tried dozens of different versions, still having the perfect Tom Yam elude me. Specifically, I’m trying to recreate a recipe I’ve had a a certain Thai restaurant. Leela, it says part I here, is there a part II that has the actual recipe. Please link to if you have that. Thank you for your site! I have made your recipe several times and oh I loved it! To me there is no going back to other Tom Yam recipe(s) than your(s). Ha ha ha! I totally understand where you’re coming from. I am originally from Russia, and whenever I say I’m cold (which this winter has been just about every day), there always happens to be an American around who responds “well, aren’t you used to it?” I mean, come on, people! I am from Taiwan and few times people will say: oh! I love Thai food, when they hear I am fromTaiwan.